The ‘Woodland Festival’ event is part of a public engagement and consultation process that has been funded by a Heritage Lottery Fund Start Up grant. The grant was awarded to support the Findhorn Hinterland Trust, working with local landowners, develop an integrated vision for how ‘wild land’ to the east of the Findhorn Village Dunes Road and to the north of the Park Ecovillage, might be cared for. This event is about raising awareness of this special area, gathering information in a fun way to help develop a vision for its future management and an opportunity to get involved and find out more about the Trust’s work. 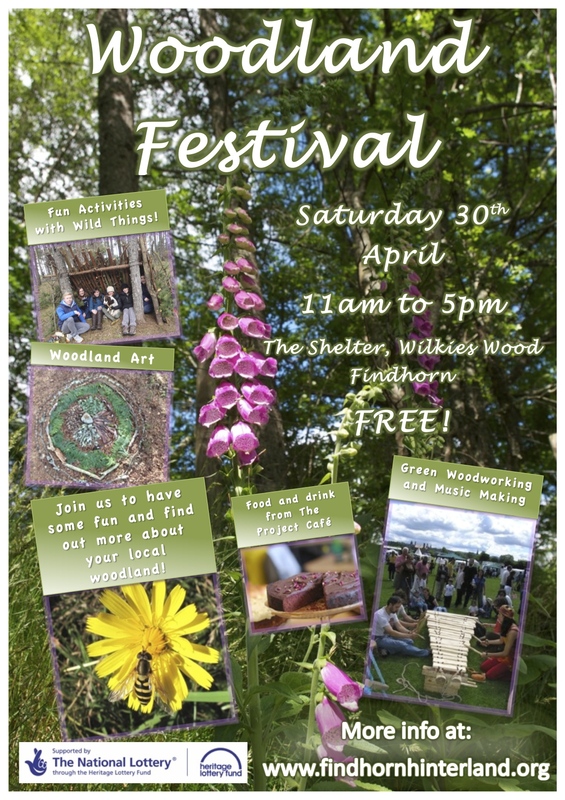 The celebration will take place on Saturday the 30th of April from 11am until 5pm in the middle of Wilkies Wood where the Woodland Shelter has been built (see site map elsewhere on this site). There will be a range of creative activities for all ages that will introduce people in a fun way to the nature of the area. Some events will take place at specific times such as the unveiling of the new Edible Woodland Garden signs and possible tractor rides so watch out for the booking sign-up forms. Do come and join us for a free, hands-on, fun event! Where to Park. Come to The Park Eco-village Findhorn. The pedestrian entry point for the festival is at the top of the runway and will be well signed so turn left after turning off the main road and proceed past the Phoenix Shop, parking where you can on the way up. If there is no space, additional parking is available at the lower Caravan Park area, which was on your right as you came in the entrance. The pedestrian path to the event will be marked and is suitable for buggies, but for disabled access please phone beforehand on 07825212816, so we can make it easier for you to get there and join in. If you would like to help out on the day or wish further information do get in touch at [email protected] or phone on 07825212816.